Have your logo turned into a tattoo or choose from a themed selection with our tattoo artists dressed to match. Inkwear are seasoned temp tattoo producers with a strong high-street and supermarket presence. 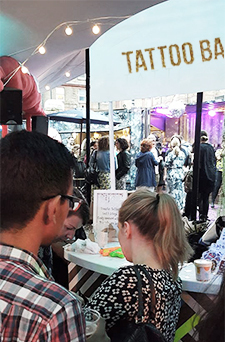 Now we offer the opportunity to tailor your event with your own tattoo designs applied by our water-pistol wielding temp tattoo artists and tattoo bar. Perfect for product launches, parties and corporate events of any scale. * A range of our own highest quality designer tattoos, themed to match your event. Prices start at £300 for a mix of 300 tattoos. * Highly trained water-pistol wielding Temp Tattoo Artists to apply your themed tattoos, 3 hour min. hire at £50 per artist p/h. The artists can also wear fully branded items.